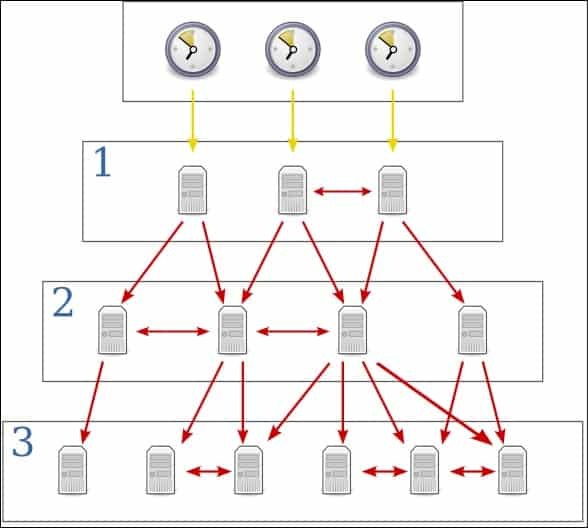 Network Time Protocol (NTP) is an application layer protocol used for clock synchronization between hosts on a TCP/IP network. The goal of NTP is to ensure that all computers on a network agree on the time, since even a small difference can create problems. For example, if there is more than 5 minutes difference on your host and the Active Directory domain controller, you will not be able to login into your AD domain. Host A is configured to use a public NTP server uk.pool.ntp.org. Host A will periodically send an NTP request to the NTP server. The NTP server will provide the accurate data and time, so Host A can synchronize its clock. NTP uses a well-known UDP port 123. The current version is NTPv4, and it is backward compatible with NTPv3.